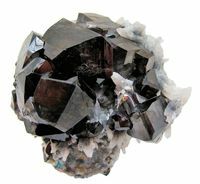 Group of honey-brown, translucent when backlit, cassiterite crystals set on a matrix of crystallized quartz. Several of them are twinned. No damage. Overall size: 98 mm x 90 mm x 72 mm. 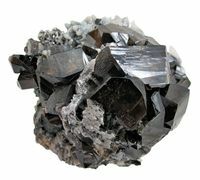 Main cassiterite crystal: 40 mm wide. Weight: 955 g.